AUSTELL, Ga. (Jan. 26, 2016) – YKK AP America unveils the YES 60 family of storefront products, including the FI, TU and XT models, providing 6-inch solutions to meet growing market demands. The YES 60 line is designed to accommodate taller and wider storefront openings, allowing more natural light at a lower installed cost than alternatives. With the addition, YKK AP now boasts a core line of 6-inch solutions, including corners and thermal doorframes. One of the most flexible storefront design choices on the market, the YES 60 FI is 10 percent structurally stronger than the TU and XT systems, allowing for greater vertical and horizontal spans. 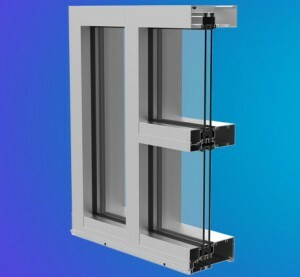 The YES 60 FI accepts from ¼-inch up to 1-inch low E insulating glass, meaning the system can deliver the performance necessary for climate zones 1 and 2. The large span, thermally broken YES 60 TU utilizes ThermaBond Plus® technology, a patented process that greatly improves adhesion of the polyurethane thermal break material to the extruded aluminum. The outside glazed TU model accepts 1-inch insulating glass. Part of the enerGfacade line of solutions, the YES 60 XT large span high performance storefront features dual thermal barriers that maintain a comfortable interior for building occupants. The YES 60 XT offers best-in-class thermal performance, including a U-factor of 0.38. All YES 60 models feature the industry-leading sill flashing design, featuring no blind seals, tall back leg for enhanced water resistance, and patent pending three-point attachment of end dam. The option of side lite curtain wall covers, pre-engineered corners and an alternative anchoring system further expands design choices. Additionally, all YES 60 models are compatible with the YES 45 storefront, and integrate with the ThermaShade® Sun Control system and Luminance® Light Shelf technology.